As background, we note that the volume of single ticket orders changes from year to year in this market, as it does in every market. A number of factors drive purchase volume: the number of total performances will vary each year. So will the demand for tickets that accompanies the popularity of the productions offered on stage. Some seasons are just “hotter” than others. In this analysis, the 2008-09 season marked a significant downturn in total ticket orders for the organizations included in our study – a one-season drop of about 20%. The 2008-09 season coincided with the worst (fears) of the Great Recession. 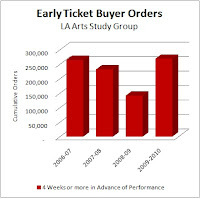 This one year drop in total sales, accompanied by anecdotal reports of swings in buying patterns, offered a unique opportunity to use this particular data from a very large arts market to explore and quantify significant changes in buying behaviors. Overall, near-performance advance ticket order volume was relatively consistent during the multiple-year study period. 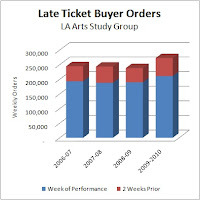 About 35% of total single ticket orders occurred during the week of the performance and about half of all orders (47%) were made during the two-week period prior to the performance. However, these ratios ceased being normative during the 2008-09 Season - the year that witnessed the large decline in total single ticket orders. Week-of-performance sales rose from 35% to 46% of total orders and the two week ratio moved from 47% to 57%! These ratios were significant to be sure, and triggered our deeper dive into the raw transactional data. 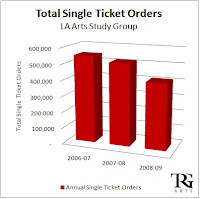 When we did, we saw that the actual number of orders for single tickets during the final weeks of sale in 2008-09 was virtually identical to the number of orders in comparable periods for prior seasons. That is, the number of households making a last minute purchase was the same as it historically had been – not more in number, just a higher proportion the total. The bigger news in this analysis is that early ticket order volume was significantly lower in 2008-09. Advance single ticket orders fell behind historic sales pacing patterns beginning with the very first weeks of sales results. Thirteen weeks out, single ticket orders were already 60% behind the historic sales pace. As each subsequent week unfolded, this gap closed slightly – until the final couple of weeks. As the performance date approached, order volume increased as prospects finally made their decision to purchase. The real story is that at the peak of the Great Recession, advance buyers in this large market appear to have decided to stay home – or at least, to delay their purchase. Their buying pattern in 2008-09 differed sharply from recent historic advance pacing. That created the perception of increased last minute buying because such a high proportion of those who did buy made their purchase nearer the performance date. In truth, however, the walk-up line was no longer and near-curtain traffic no greater than in other seasons. So what happened next? During the 2009-10 Season, total single ticket orders recovered, far outpacing order volume experienced in 2008-09 – exceeding even the results of the two prior years. What fueled this growth? Advance sales returned to pre-recessionary patterns. And “week-of” sales? They grew proportionally with overall ticket order growth and the ratios remained consistent with seasons prior to 2008-09. Questions and great curiosity remain, however. When there is a decline of 20% of the total audience in a single year, one has to ponder – who bought and when? Who skipped that season? Specifically, which patrons changed their behaviors? When sales rebounded in the following year, which patron group drove that success – did early buyers “come home?” Did arts organizations do what they have always done – find lots of brand-new buyers? One of the great things about being a part of the TRG team is that we get paid to be curious. These kinds of questions make us both a bit crazy and really eager to dig in, seeking quantifiable answers. That’s just what we’re doing next. We’ll be back to you when we have more results to share. Do you have a myth you would like busted? Leave a comment and we’ll add it to the list.